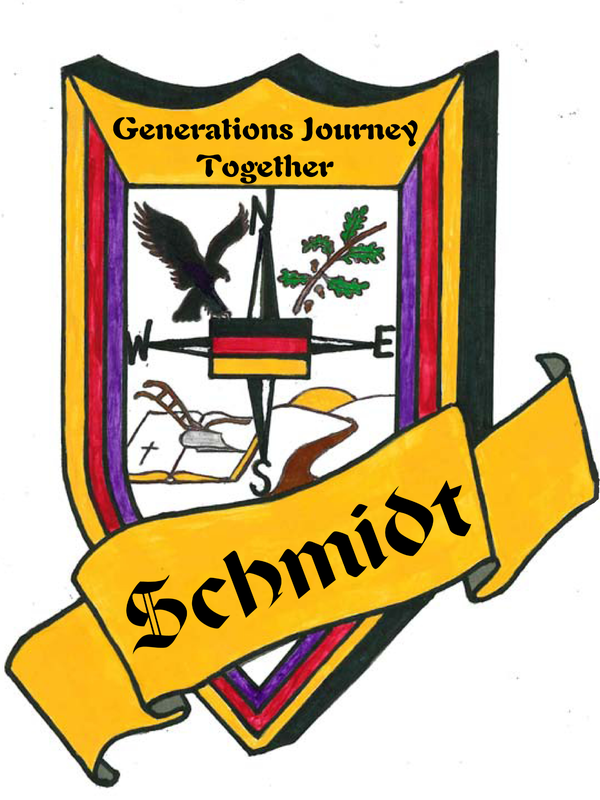 Choose the Schmidt Family Crest Design! * 1. 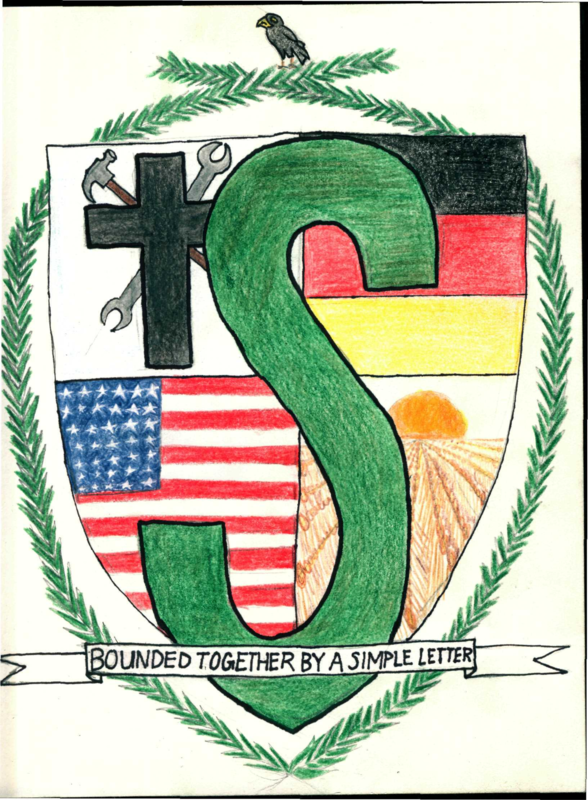 Which design do you prefer as the official crest for the Schmidt family of Machtlos, Germany? This family crest is divided into four quadrants. The upper left quadrant contains a hammer and anvil, which symbolizes the trade (smithing) that gave our family its name, “Schmidt”. The upper right quadrant contains an American flag and a Hessian flag intersecting one another, representing our American identity and our roots in the Hessen Kassel region of Germany. The lower left quadrant contains a Linden tree, which is common in the forest-rich region of Hesse that our ancestors came from, and which also pays homage to the Lindemann family, with whom the Schmidts often intermarried. The lower right quadrant contains a stalk of wheat, symbolizing the agricultural lifestyle that supported our ancestors when they came to America. In the center is the Bundesadler (the eagle of Germany), paying tribute to the Germanic culture and heritage of our ancestors that still influences us today. At the bottom is a banner with the motto “Macht aus Machtlos,” which translates to “Strength out of Powerlessness” (a play on words, given that our ancestors hailed from a village called Machtlos) — appropriate, given that we came from a family of lowly peasants in an obscure little hamlet, and now have become one of the largest and most successful German immigrant families in America. Josiah is the son of Kent Schmidt, grandson of Roger Schmidt, great grandson of Bill Schmidt, 2xgreat grandson of William Schmidt, 3xgreat grandson of Karl Schmidt, 4xgreat grandson of Dietrich Schmidt Jr., 5xgreat grandson of Dietrich Schmidt Sr., 6xgreat grandson of Johann Friedrich Schmidt, 7xgreat grandson of Johannes Schmidt Jr., 8xgreat grandson of Johannes Schmidt Sr., 9xgreat grandson of Hans Heinrich Schmidt, and 10xgreat grandson of Hans Schmidt. 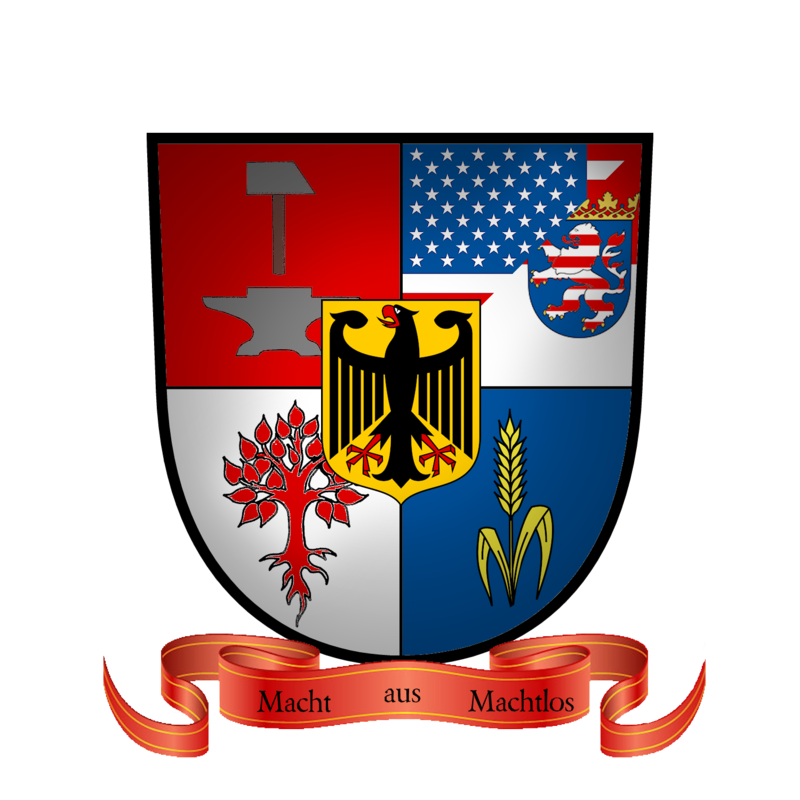 The family crest is divided into 4 quadrants which represents different aspects of the Schmidt family. The upper left quadrant symbolizes all of our hard work. Our ancestors and some of us today have high labor intensive jobs. Many of the jobs included, tar haulers, shoemakers, miners, farmers, house painters, tailors, soldiers, church elders, church office administrators, mayors, metal smiths and many more. I wanted to represent this because our family is known for being hard working. The hammer, wrench, and cross represents the working class all together and includes some of the jobs the Schmidts had when first established. The upper right quadrant represents where our roots originated which is in Machtlos, Germany. Jordyn is the daughter of Jeff Schmidt, granddaughter of Jack Schmidt, great granddaughter of Chris Schmidt, 2xgreat granddaughter of Henry Schmidt Sr., 3xgreat granddaughter of Conrad Schmidt, 4xgreat granddaughter of Dietrich Schmidt Sr., 5xgreat granddaughter of Johann Friedrich Schmidt, 6xgreat granddaughter of Johannes Schmidt Jr., 7xgreat granddaughter of Johannes Schmidt Sr., 8xgreat granddaughter of Hans Heinrich Schmidt, and 9xgreat granddaughter of Hans Schmidt.